Hopefully some of you have been playing with Server 2008 R2 while it has been in Beta. 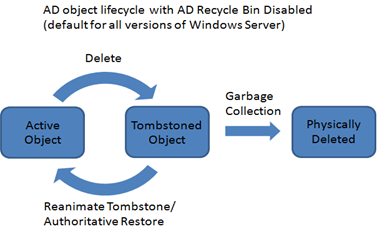 One of the features I’m looking forward to most is the AD Recycle Bin. Yes you heard me correct. We now have an easy method for restoring accidently deleted objects. In the past our only recovery method out of the box was to perform an authoritative restore of an object. That method had several issues that always rubbed me the wrong way. First you had to be in Directory Services Restore Mode (DRSM). And ever since Server 2003 we could use tombstone reanimation but that removed most of the non-link-valued attributes. This lead to additional work after the restore. The default tombstone lifetime was 180 days with Server 2003 and 2008. Now when an object is deleted it is not marked for tombstone it is marked as deleted. It places the object in the Deleted Objects container which is hidden but can be located here – CN=Deleted Objects. When you want to restore an object there are two methods that I”m aware of, one using PowerShell and the other using LDP. When restoring multiple items that may be linked (OU or Group that contains Users) you will want to start at the highest level. An object can only be restored using those methods if it is still within the Deleted Object Lifetime. The attribute is msDS-deletedObjectLifetime and if you look it up it will have a null value which the default time is 180 days. I did not know about that coming in R2. I really need to look into R2 since I”ve been studying a lot of Server 2008 lately. Hopefully my next job is on 2008 or that the company will be migrating to it soon. Some 3rd party solutions like Active adminsitrator can provide even more powerful ways to do active directory restores. The tool can recover active directory objects, group policies, objects passwords as well as security separate from objects in a very intuitive way. Lepide Active Directory Management and Reporting (LADMR) software is a proficient Active Directory management tool that can relieve administrators from the use of complex ADAM tools and command line utilities. This software has been developed to manage AD objects including users, user properties, general attributes, and other non user objects conveniently without any scope of error. The product can easily recover the deleted objects and group policies.